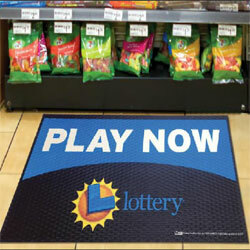 Our rubber logo mats are manufactured to be used for a variety of applications; both indoors or outdoors. Some rubber mats can be used as outside scrapers and provide slip-resistant for entrances. Some have anti-fatigue properties to provide worker safety and comfort. 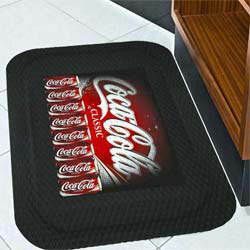 Others can be used as promotional mats for trade shows or point-of-purchase. And digital printing of your custom logo results in crisp vivid images providing a near photographic quality. Please click a product below to view details and ordering information. 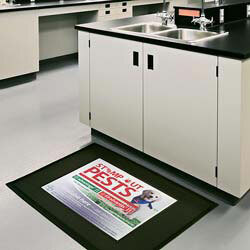 Safety rubber logo mat, Full color photographic images. 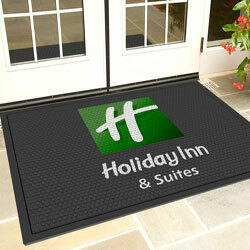 Polymeric material molded into the circular pattern rubber mat face.Great for inside or outside entrances. Rubber logo mat. Diamond texture pattern for slip resistance. Digitally printed unlimited colors. For indoor applications. Great for point of purchase or retail promotions. Anti-fatigue industrial logo mats, 3/4 Thick Nitrile PVC/foam material. Imprint photographic images. Comfortable logo mat to stand on. Anti-microbial and slip resistant. Anti-fatigue industrial logo mat 5/8 Thick. Digital printed photographic quality images. High traction Non-slip diamond pattern top. Heavy duty industrial matting.